You must obey the instructions on these signs. Stop - Stop and give way as required. If you turn at an intersection, give way to pedestrians crossing the road you are entering. Give way - Slow down, stop if necessary, and give way as required. If you turn at an intersection, give way to pedestrians crossing the road you are entering. Roundabout - Slow down or stop and give way to vehicles on the roundabout. No U-turn - Do not make a U-turn on this length of road. 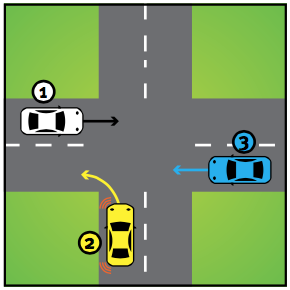 Wrong way — go back - You are driving in the wrong direction on a one way road. No turns - Do not turn right, left or make a U-turn – you must only drive in the direction indicated. No left turn - Do not turn left. Keep left - You must drive to the left of this sign. No right turn - Do not turn right or make a U-turn (unless there is a ‘U-turn permitted’ sign). Two way - Vehicles travel in both directions on this road. No entry - Do not drive onto the road beyond this sign. One way - You must drive only in the direction indicated. Trucks and buses use low gear - Used on steep routes to limit truck and bus speeds without requiring the primary brake. Keep left unless overtaking - On a multi-lane road, you must not drive in the right lane unless overtaking, turning right, making a U-turn, avoiding an obstacle or driving in congested traffic. Do not drive faster than the speed shown. In poor conditions, it is safer to drive slower than the limit. Indicates the speed limit in the area you are about to enter. The previous speed limit has ended and the general default speed limit applies. You are leaving the area speed limit and re-entering a general speed limit area. Some speed limit signs show the times they apply (e.g. school zones). School zones may have flashing lights to draw attention. Other variable speed limit signs have a changeable display, for example in tunnels. These signs seem similar to normal speed signs except they have illuminated white numerals surrounded by red lights on a black background. These signs may also be combined with road control signs to direct traffic. Shared zone - An area where pedestrians have total priority over all traffic. End shared zone- If there is no sign indicating a different speed limit, the default speed limit applies. These signs warn you of hazards. You must obey these signs that show the direction to take when driving past hazards. Drive to the left of the hazard. Drive to the right of the hazard. Driver either side of the hazard. These signs (normally in pairs) show the width of a bridge, stock grid crossing or narrow section of road. Drive to the right of the sign. Drive to the left of the sign. Provide information about safe road use, routes, directions, destinations and points of interest. 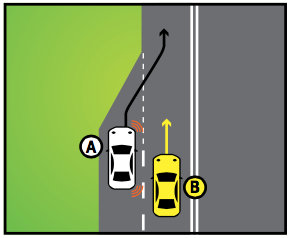 Form one lane - Form a single lane with other drivers. Turn left at any time with care - This sign indicates the presence of a slip lane (a lane for left turning traffic separated from the rest of the road by an island). Slow vehicles use left lane - Used at the beginning of a long or steep climb where a slow-moving vehicle may delay other vehicles. No through road - The road indicated is a dead end. Reduce speed now - Slow down from the motorway speed limit to the much slower speed limit on the next section of road. Services - The services shown (first aid, tourist information, caravan parks or meals) are available on the road ahead or on a side road. Local traffic only - The road past the sign is not intended for through traffic. May appear at the entrance to a local area or at detours where local traffic is allowed to enter the work area. Tourist drive information - Indicates a scenic drive that connects a number of tourist attractions. Traffic lights control traffic and pedestrians to improve safety and access to roads. Be prepared to react to a light as it is an offence to disobey a red or yellow traffic light. 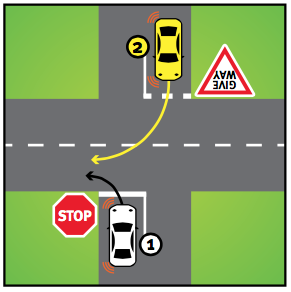 Do not drive past the STOP line or traffic light at a red or yellow traffic light/arrow. The yellow light is the start of the red light, not the end of the green. You must STOP on a yellow light, unless it is unsafe (in which case you may proceed). A flashing yellow light/arrow means proceed with caution (give way) to avoid a collision. Drive through green traffic lights/arrows when clear. A bus, taxi, limousine, emergency vehicle or a bicycle, may drive through white B lights. If the light is green and oncoming vehicles are approaching, you should move into the intersection if safe. When a safe gap occurs, complete the turn. If no gap appears until the lights turn yellow or red, complete the turn on the yellow or red light. These people may direct traffic with hand signals (overruling signs and traffic lights). Traffic controllers direct traffic at worksites. Obey lawful directions or signals. A speed limit sign has a number in a circle showing the maximum speed in km/h for good conditions (do not exceed to overtake). A lower speed suits poor conditions. Electronic variable speed limit signs respond in real time to the conditions (e.g. reduced speed for congestion or adverse weather). To indicate a change, the lights surrounding the limit flash. These signs help keep traffic flowing and minimise stop-start driving. There are no reduced speed limits in Queensland for learner or provisional drivers, just drive according to the speed limit and conditions. You should drive at the default speed limit for built-up areas (50km/h), unless you pass a speed limit sign that shows a different limit. A built-up areas include residential, commercial and industrial areas where there are buildings on land next to the road, or street lighting, at intervals of not more than 100m for a distance of 500m. It includes the whole road (if less than 500m long). The default speed limit on a road outside a built-up area is 100km/h unless otherwise signed. Only drive at 110km/h if there is a speed limit sign. Vehicles over 12t GVM or buses over 5t GVM are restricted to 100km/h, regardless of any higher speed limit. A speed zone is a road that has a specific speed limit. A speed zone is defined by a speed limit sign at the start and another showing a different speed limit at the end. If you turn into another road before you see the end sign, you should use the default speed limits until you see a speed sign. A speed limit on a length of road does not apply to roads leading off from that road. A variable speed zone has different speed limits applying at different times as shown by special signs that may be electronically controlled (e.g. school zones). The maximum speed limit in a school zone is usually 40km/h or 60km/h as shown. This speed limit applies on school days between the hours shown (otherwise the last speed limit sign before the school zone applies). School zone hours and speed limits may differ, so read the sign. When an electronic sign is blank, follow the speed limit shown on static signs. A variable speed limit zone may also be applied on a motorway, long bridge or in a tunnel. This will be shown through electronic variable speed limit signs and selected static signs. This sign tells you the recommended speed in good driving conditions through the curves ahead. It shows extra caution and reduced speed is needed temporarily. Indicate long enough to tell other road users before you turn. If turning left, position your vehicle close to the left side of the road. If there is a slip lane, turn from the slip lane. Turning left on a multi-lane road with traffic arrows. When turning right into a two-way road, keep left of the centre of the road you enter. Follow turn lines if marked. When turning right from a one-way street, keep your vehicle close to the right side of the road and make the turn as indicated from the right lane or as marked. When you turn right from a two-way road at an unmarked intersection, pass to the right of the centre of the intersection unless turn lines indicate differently. there are no signs or road markings prohibiting a U-turn (at traffic lights only make a U-turn if a sign states you can). You may drive on or over a painted island surrounded by one continuous line for up to 50m to enter or leave the road or enter a turning lane that begins immediately after. You must not drive on these islands if they are at merge points and separate vehicles travelling in the same direction or if the island creates a slip lane. You are approaching a roundabout. Give way to all vehicles on the roundabout. Indicate, if necessary, as you approach and enter. Drive clockwise around the roundabout. Follow road arrows and direction signs. Indicate, if practical, before exiting. Left turn – Signal left on approach and continue to signal as you exit. Straight ahead (second left exit) – Signal not required on approach, but if practical, signal left as you exit (same for both lanes). Right turn – Signal right on approach and, if practical, signal left as you exit. (Same for 4). 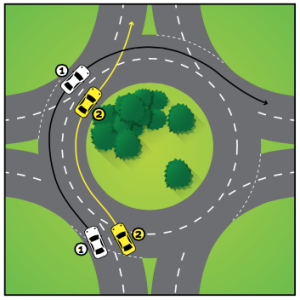 Lane changes are permitted on roundabouts as long as they are legal and safe. Only use the left lane to leave the roundabout halfway around or earlier (unless arrows indicate otherwise) - the path taken by vehicle 1 is illegal. Cyclists may exit a roundabout from either lane but must give way from the left lane to vehicles exiting the roundabout. At a roundabout you must give way to vehicles already on the roundabout. Motorcyclists and cyclists can be hard to see - keep a special lookout. Watch out for large trucks as they may need more space to manoeuvre. Signal for long enough to give sufficient warning (e.g. 5 seconds when moving from a parked position). Turn off your indicator after completing a manoeuvre. If the continuing road at a T-intersection bends, you must indicate if you are turning off the continuing road and going straight ahead. Vehicle must indicate right if the continuing road curves left. Vehicle must indicate left if the continuing road curves right. There are two official hand signals. About to stop or slow down. About to turn, move right or make a U-turn. Hand signals are the only time a body part may be outside the vehicle. Do not use hand signals to tell drivers to overtake. You may only use the horn to warn others of your approach or position. in any other case: slowdown and, if necessary, stop to avoid a collision. Learn every give way rule before the written test as it is tested in detail. Give way rules are designed to allow road users to move predictably without the danger of a crash. GIVE WAY and STOP signs are at intersections where care is needed because of limited visibility, or vehicles on the other road have priority. STOP lines (solid lines at intersections) and GIVE WAY lines (broken lines at intersections) have the same meaning as signs and are used in case a sign is missing (applies at railway crossings). When you face a GIVE WAY sign/line, you must slow down or, if necessary, stop. You must then give way to vehicles approaching, entering or on the intersection. If you turn, you must also give way to pedestrians crossing the road you are entering. Do not drive past a GIVE WAY sign on a narrow section of road when a vehicle is approaching. When you face a STOP sign/line, you must bring your vehicle to a complete stop just behind the line or where you have a clear view of the intersection before entering it (if no line). You must give way to vehicles approaching, entering or on the intersection. If you turn, you must also give way to pedestrians crossing the road you are entering. 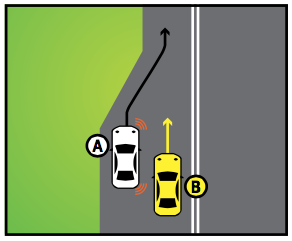 Vehicle 1 must give way to vehicle 2 because vehicle 1 is turning right across vehicle 2’s path. 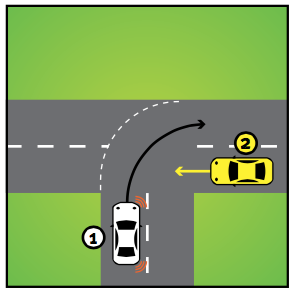 Vehicle 2 must give way to vehicle 1 because it is turning right across vehicle 1’s path. When changing lanes, give way to the traffic in the lane you are moving to. Example 1 - When lines of traffic merge (no marked lines), give way to vehicles ahead. Vehicle B gives way to vehicle A. Example 2 - If your lane comes to an end, you must give way to traffic in the lane you are moving to. Vehicle A gives way to vehicle B. You must give way to all vehicles and pedestrians when you make a U-turn, including traffic facing STOP or GIVE WAY signs. Do everything practical to give way to an emergency vehicle sounding a siren or flashing lights. When you drive from a slip lane, give way to all bicycles and pedestrians on the slip lane and all vehicles (except vehicles making a u-turn) on the road you are entering. 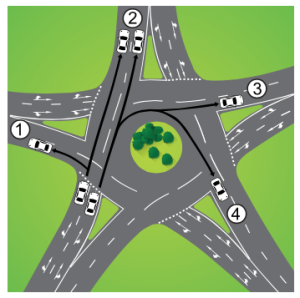 A T-intersection consists of two roads where one ends at the intersection with a second continuous road. If driving on the road that ends, give way to all vehicles on the road continuing through if they are approaching, entering or on the intersection. If you are on the road that ends and a vehicle on the road continuing through faces a STOP or GIVE WAY sign, you do not have to give way. At this T-intersection, the continuing road (marked with broken white lines) goes around a corner. If you are leaving the continuing road to go straight ahead, you must give way to a vehicle going around the corner on the continuing road. Vehicle 1 is on a continuing road. Vehicle 2 is turning off the continuing road and must give way to oncoming vehicles travelling on the continuing road (vehicle 1). You may reverse only as far as reasonable and only when safe (including on driveways). Always give way to pedestrians crossing the road you are entering. You must give way to pedestrians and cyclists on or entering a pedestrian/children’s crossing. A vehicle stopped to give way at a crossing must not be overtaken. If you are turning right into a multi-lane road from a single lane road, give way to oncoming vehicles turning left. If you are turning right at an intersection, give way to oncoming vehicles if they are going straight through or turning left. You must give way if you are turning across the path of a vehicle. 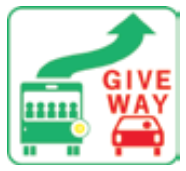 Give way to all road users when leaving a property to enter a road, or entering a property from a road. When more than 2 vehicles are at an intersection - combine the give way rules. Vehicles 1 and 3 are not required to give way to any other vehicle. Vehicle 2 must give way to vehicle 3 coming on the right. Vehicle 1 must give way to vehicle 2 on the right. Vehicle 2 does not have to give way to any other vehicle. Vehicle 3 must give way to vehicle 1 on the right. 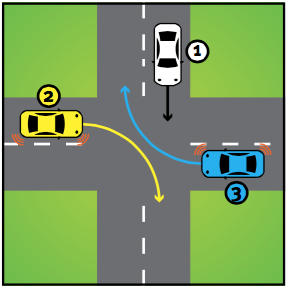 Vehicles 2 and 3 aren’t required to give way to one another as their paths do not cross. When driving out of a park, signal for at least 5 seconds and give way to other vehicles. Give way to trains at a GIVE WAY or STOP sign/line at a level crossing. Give way when a person in charge of a hard to control horse gives a signal (raising a hand and pointing to the horse). Stop on the side of the road and turn off the engine. Remain stationary with the engine off until there is no chance noise or movement from your vehicle will further upset the horse. Lane lines are usually broken. You can cross broken lines to turn or overtake. However, lane lines are continuous (unbroken) close to a controlled situation (e.g. traffic lights or a STOP sign). Do not cross continuous lane lines to turn or overtake (though they can be crossed to pass a cyclist). Motorcyclists may cross continuous lines when lane filtering. You may cross a single broken dividing line to overtake, U-turn or enter/leave a road. You may cross a single continuous dividing line to enter/leave a road, or pass a cyclist. Do not cross a single continuous dividing line to overtake or U-turn. You may cross a dividing line that has a broken line to the left of a continuous line to overtake, U-turn or enter/leave a road. You may cross a dividing line that has a continuous line to the left of a broken line to enter/leave a road, or pass a cyclist. 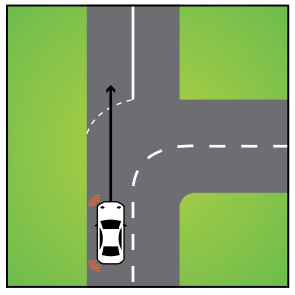 You must not cross a continuous line to the left of a broken line to overtake or U-turn. Entering/leaving a road includes turning into another road and private property. Do not cross a dividing line that has two continuous lines (except to pass a cyclist). 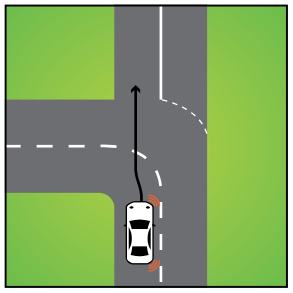 Do not cross a dividing line that has a continuous line or a continuous line to the left of a broken line to U-turn. Note: A driver turning left from a multi-lane road must turn from the marked or slip lane. In a lane marked with arrows, drive only in the direction/s indicated. Do not travel in a lane marked with a red cross above it. A flashing red cross means you must leave the lane as soon as it is safe. A white, green or yellow arrow, or a speed limit sign above the lane, means you may drive in that lane. A LANE CONTROLS END sign means you may use any lane after the sign even if there were red crosses showing previously. Some lanes are only for certain vehicles. Only a bus, taxi, limousine, or bicycle can drive in a bus lane. Transit lane T2 – must have at least 2 people in the vehicle. Transit lane T3 – must have at least 3 people in the vehicle. Bicycle lanes are for cyclists. You may stop/park in a bicycle lane unless there are signs or road markings prohibiting it. Give way to bicycles when moving into a bicycle lane. Overtake only if you have a clear view of approaching traffic and it is safe. When you are being overtaken do not speed up. Keep a safe following distance behind. Check ahead for approaching traffic. Check behind for other vehicles. Signal right to give sufficient warning. Accelerate and move right (do not exceed the speed limit). Signal left when clear of the vehicle you are overtaking. Move back to the left lane as soon as it is safe. Overtaking more than one vehicle at a time increases your risk of a crash. You can overtake a vehicle on the left on a multi-lane road, if the vehicle is turning right or if the vehicle is stationary and it is safe. What are the road markings? Do not drive past this sign when an oncoming vehicle is approaching. Do not overtake after you have passed this sign. Do not overtake any vehicle on a bridge where this sign appears. Unless it is safe to do so, do not overtake a vehicle displaying a DO NOT OVERTAKE TURNING VEHICLE sign if it is signalling to turn left or right. A long vehicle on a multi-lane road may use the left-hand lane or the marked lane next to the left lane to turn left. It’s the same for a right turn - they may use the right-hand lane or the marked lane next to the right lane. Leave a safe distance between you and a cyclist when overtaking or passing. Motorways are divided roads designed for fast-moving vehicles. For safety, slower vehicles and pedestrians are not allowed on these roads. Most motorway entrances list the vehicles not allowed on the road. If you face the sign, WRONG WAY – GO BACK, as you enter a motorway, stop and reverse when safe – you’re on an exit ramp. Plan your route before you enter a motorway. When entering the motorway, look for a gap in the closest lane and build speed on the on-ramp so you enter at the speed of the traffic. Watch for vehicles entering from an on-ramp and adjust your speed to allow them to enter. Be in the correct lane as your exit approaches. Continue to the next exit if you miss yours. Roadworks ensure safe, efficient and convenient roads for everyone. The ROADWORK AHEAD sign gives advance warning of sites. Be prepared for changed conditions and slow down if required. The workers sign is a temporary warning, used only while applicable, that roadworkers are ahead on or adjacent to the travelled path. Drive with due care for your own and roadworkers’ safety. This multi-message sign warns of sites, and imposes a speed limit. This multi-message sign warns roadworkers are ahead on or adjacent to the road, and imposes a speed limit. The SPEED LIMIT sign at roadworks creates a temporary speed zone that applies until the next speed limit sign. The STOP/SLOW bat is used by a traffic controller. 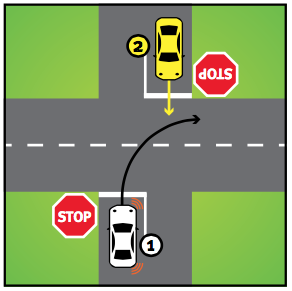 STOP = stop a safe distance from the traffic controller and wait. SLOW = proceed with caution. The TRAFFIC CONTROLLER AHEAD/PREPARE TO STOP sign warns that traffic may be required to stop ahead and is only used when a traffic controller is on duty. The PREPARE TO STOP and SIGNALS AHEAD signs warn of temporary traffic signals. Be prepared to obey the traffic signals ahead. The STOP HERE ON RED SIGNAL sign indicates where to stop at a red light. There may or may not be a STOP line marked. The TRAFFIC HAZARD AHEAD sign warns of unexpected hazards ahead in emergencies. Take care and drive to the conditions. The SLIPPERY ROAD sign warns of hazardous road surface conditions. Take care and drive to the conditions. The LOOSE STONES sign warns of hazardous road surface conditions. Take care and drive to the conditions. The LANE STATUS signs warn that 1 or more lanes are closed ahead. Bars = closed lanes, arrows = open lanes. The LINE MARKERS ON ROAD and SURVEYORS AHEAD signs warn that line markers or surveyors are working ahead on or adjacent to the road (only used while workers are in the area). Drive with care for your own and roadworkers’ safety. The ROAD PLANT AHEAD sign is used where machinery is working on the roadway. Take care and be prepared for plant being operated without any form of delineation or traffic control. The ROAD WORK supplementary plate may be used with a SPEED RESTRICTION sign. The END ROADWORK sign defines the end of a site. It does not cancel any previous speed limit - roadwork speed limits apply until the next speed sign. This multi-message sign defines the end of a site and reinstates the speed limit. Speeding vehicles threaten the safety of other drivers and roadworkers. While under construction or repair, the road surface may not be safe at the normal speed. Loose gravel may damage vehicles. Road surfaces may be uneven. Road lanes may have narrowed. Roadworkers may not always be visible when working. When roads are widened, kilometres of utilities (pipes, electrical and phone lines) have to be relocated, which takes time. Some roadwork jobs are mobile (line markings, road patching and mowing) and reduced speed limits increase safety. Disobeying road rules near railway crossings can be fatal as crashes here are generally more severe because trains are heavy and fast. Yellow painted cross-hatching at a level crossing is legally part of the crossing. You must stop at a STOP sign/line and give way to trains. You must give way at a GIVE WAY sign/line to any trains. Get off the crossing as soon as you can do so safely. Slow down, or stop if facing a STOP sign, look both ways and listen for trains. Take care if sun, fog, vegetation or buildings obscure your view of the tracks. If stopped for a train, don’t move until warning lights (if installed) have stopped flashing, and you have checked another train is not approaching. Alcohol impairs your ability to drive and increases your crash risk by affecting your judgment, vision, coordination and reflexes. Do not drive if the level of alcohol in your blood is over the limit for the licence you hold or the vehicle you drive. Police regularly carry out random breath tests to detect/deter drink drivers. Refusing to take a roadside breath test is an offence. If you crash when over your alcohol limit, comprehensive insurance will not apply and you will have to pay for damages. Compulsory Third Party insurance may be affected. If you plan to drink - stay overnight or plan alternative travel (taxi, public transport, non-drinking driver). Discourage people from driving when they’ve been drinking. Serve non- and low-alcohol drinks. Let people ask for a refill rather than topping up so they can count drinks. Do not mix drugs and alcohol. Catch public transport, a courtesy bus, a taxi or get a lift with a sober driver. Walk with sober friends - a group is more visible. Walk on the footpath (not the road) and, if there isn’t one, walk along the edge facing oncoming traffic. Cross at traffic lights, crossings or crosswalks (if none, cross under a streetlight). Carry or wear something light/reflective to increase visibility. Walking when intoxicated is safe. Around 17 intoxicated pedestrians are killed annually on Queensland roads. Many drugs can impair your ability to drive (and increase crash risk) by affecting your vision, mood, judgment, muscle control, reflexes, coordination and level of alertness. Combining drugs with alcohol further increases the risk. It is ok to drive after taking over-the-counter or prescription medication. Many over-the-counter and prescription drugs (even in recommended doses) can reduce driving ability. Ask your doctor or pharmacist if medication can impair your driving. Avoid driving if you are taking medications that affect driving. Read the consumer information and take note of the warning label. Illegal drugs (e.g. cannabis, speed, ecstasy and heroin) can affect your driving. Never drive if you have consumed illegal drugs. Mixing drugs, or mixing drugs and alcohol, can affect your ability driving. If you crash while under the influence of drugs, your comprehensive insurance cover will not apply and you will have to pay for any damage caused. Compulsory Third Party insurance may also be affected. Vehicles exceeding these dimensions are required to operate under specific guidelines. Only vehicles 7.5m or more in length (including a car towing a caravan) are allowed to show a DO NOT OVERTAKE TURNING VEHICLE sign. When displayed, these vehicles may turn left from, or partly from, the lane next to the left lane. These vehicles can also turn right from, or partly from, the lane next to the right lane. if driving a road train, drive at least 200m behind another long vehicle in front. Failing to secure loads safely on a heavy vehicle risks injury to you and road users and a large damages bill. Correct positioning involves centering and evening the load so there is no tilt in any direction. The load of a heavy vehicle must not be more than the regulated mass for an axle, axle group, the vehicle’s GVM/GCM (whichever is the least), or the registered seating capacity. Vehicles with a 4.5t GVM or more must enter a weighbridge checking station (if open or directed by an authorised officer). All loading must be fastened safely and correctly. If you are carrying iron, timber, piping or similar material, it should be parallel with the sides of the vehicle and fastened to not flap or sway. If you are carrying a loose load (gravel or quarry products), it must be loaded so that no part can fall or dislodge during transport. If you carry freight containers, be aware of container height differences. The safest way to secure containers is using twist locks. Freight containers transported by road must have a container weight declaration. Fully loaded, you should have a good view to the front, on both sides and behind (using mirrors). Queensland law requires all loads to be restrained to the standards of the Load Restraint Guide which outlines the safety principles to be followed to ensure safe carriage of loads - all heavy vehicle drivers should have a copy. Any part of a load that falls should be removed from the road as soon as possible. If you are driving a vehicle that is required to display specific signs (e.g. ROAD TRAIN, LONG VEHICLE, OVERSIZE, OVERSIZE LOAD AHEAD or SLOW VEHICLE), always remove or cover any sign that is not applicable. Buses over 14.5t GVM or prime movers are to be fitted with speed limiters if they were manufactured after 1987. Buses over 5t GVM and up to 14.5t GVM have speed limiters fitted from 1 July 1991. If a vehicle is required to be speed limited, penalties apply for using or allowing others to use the vehicle without a properly functioning speed limiter. A heavy vehicle caught in excess of 110km/h will be issued a defect notice. It will be required to comply with Australian Design Rule (ADR) 65/00 and will not be allowed to operate until all repairs or modifications have been completed and cleared. A vehicle (including those with trailers) carrying a placard load of dangerous goods or weighing more than 12t must carry 3 portable triangular, red, reflective warning signs. Under the fatigue chain of responsibility provision, parties in the logistics chain must take all reasonable steps to ensure drivers don’t drive impaired by fatigue. All drivers of fatigue regulated heavy vehicles must record work and rest times in their national driver work diary during any trip further than 100km(A) from their driver base. Advanced fatigue management requires accreditation under the National Heavy Vehicle Regulator. Operating limits are used to guide schedules and driver rosters, accounting for foreseeable contingencies and reflecting the inherent fatigue risks (e.g. balancing night driving balanced against longer rest breaks). Outer limits represent when further work poses an unacceptable fatigue risk and cannot be exceeded. This limit is set nationally and based on fatigue experts and experience from current practices. Fatigue offences attract demerit points and fines in excess of $5,500. Demerits apply to offences that impact driver safety (e.g. failing to record work/rest, providing false information, falsely claiming to be in an accreditation scheme). All work diary pages must be legible, even when corrections occur. A page must be cancelled by drawing two parallel lines across it and writing the word ‘CANCELLED’ if it is difficult to read. The information should be rewritten on the next page. Public passenger services provide transport to the public for a fare and include a courtesy or community transport service. To be granted authorisation, you must hold and have held open driver licence continuously for at least 3 years. For general services, you must have held an Australian driver licence for at least 2 years of the continuous 3-year period. For taxi services, you must be at least 20 years old and have held an Australian driver licence for at least 1 year in the past 3 years. You must also satisfy medical fitness requirements and driving/criminal history checks. School buses operating outside an urban area must have flashing yellow warning lights on the front and rear of the bus that flash when children are picked up or set down. Your vehicle’s headlights, rear lights and rear number plate light must be on and visible at night or in hazardous weather conditions. Driving lights are additional headlights only allowed while your headlights are on high beam. Fog lights can be switched on and off independent of any other light. Fog lights can only be used in fog or hazardous weather conditions that reduce visibility (fines apply for inappropriate use). At night, use high beams or slow down so that you have time to react. Only wear tinted glasses at night when a specialist has prescribed them. Keep left and look to the side if oncoming lights dazzle you. If unsafe, slow down and stop until the vehicle has passed. Drive at a sufficient distance behind vehicles so you can stop safely to avoid a collision. If your vehicle combined with a caravan or trailer is 7.5m or longer, it is a long vehicle. Leave at least 60m between your vehicle and another long vehicle on single-lane roads outside built-up areas. If you tow a caravan in road train areas, leave at least 200m between your vehicle and another long vehicle. Driving too close can make it hard for others to overtake safely. A towline use to tow a car must be no more than 4m long. Parking is regulated and enforced by local governments and Queensland Police. Obey signs or line markings telling you how to park. If none, parallel park the left side of your vehicle as close as you can to the left side of the road in the direction of travel. In a one-way street, park on the left or right side of the road. Where parking spaces are marked, do not take up more than a single space, unless your vehicle is longer than the length of a space. Do not park closer than 1m to any other vehicle. Signs indicate where you can and cannot park. If these signs show hours or days, the directions apply during those times and there are no restrictions at other times. These signs may also restrict the types of vehicles in an area (e.g. no heavy vehicles). Certain vehicles (e.g. local residents) may be excluded from a sign’s restrictions. The letter P alone means there is no time limit. Regulated parking means there is a parking time limit (shown by the number in front of the P - e.g. 2P = two-hour parking). 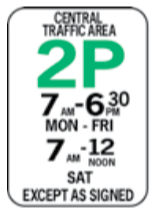 Parking is free, except where there is a metered space and then it’s free outside the times shown. pay and display (up to 10 parks) – a machine near the parks dispenses coupons that must be displayed on your vehicle’s dashboard. Follow meter instructions to operate. You must insert coins even if there are coins already in the meter. Some metered parks become clearways during peak hours so check signs before leaving your vehicle. Do not park in this area. 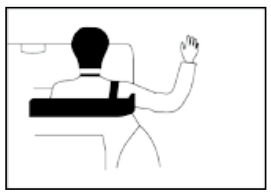 You may pick up/set down passengers/goods for a maximum of 2 minutes (unless the sign indicates longer). Do not leave the vehicle unattended. Do not stop in this area unless obeying official direction (e.g. traffic lights). V ehicles are not allowed to stop, though buses, taxis and limousines may pick up/set down passengers. The sign will show the hours of operation (usually peak-hour). Penalties include fines and having your vehicle towed. Only angle or centre park where permitted, at the angle shown by road markings, in the direction stated on the sign. Enter and leave centre parking areas by driving forward (unless a sign indicates otherwise). When you open a car door, check you won’t hit anyone. If somebody over 16 remains with the vehicle, the doors need not be locked and the ignition key may be left. Never leave children younger than 16, or animals, unattended. Red permit holders are entitled to park in any off-street parking bay (regardless of the colour of the signage) situated in areas such as shopping centres. Red permit holders may use their permit interstate and must park according to the permit conditions. Expired temporary permits are not valid nor eligible for renewal. If you continue to experience severe functional mobility impairment, make a new application for an Australian Disability Parking Permit. Fines apply for misusing a permit or parking illegally in a disability parking space. A vehicle with GVM of 4.5t or more, or is 7.5m or more in length, must not be parked in a built-up area for more than 1 hour (unless signs allow or you are actively engaged in dropping off/picking up goods). the vehicle was originally manufactured without seatbelts and passengers are 7 years or older. Passengers under 7 are not permitted without a child restraint. Under Queensland law, the driver is responsible for ensuring every passenger wears a correctly fitted child restraint or seatbelt. Passengers 16 years or older who fail to wear a seatbelt will be fined (in addition to the driver) and accumulate 3 demerit points. You must pull over and park to make/receive a call. If caught using a hand-held phone while driving, you will be fined and demerit points will be recorded. You may use a hands-free mobile phone, CB radio or any other two-way radio when driving (unless a class C learner or a P1 licence holder under 25), however, use extreme care and attention so you are not distracted. A driver must not have an animal in their lap while operating a vehicle. A person riding a motorcycle must not carry an animal between the rider and handlebars or between the rider’s arms. Pets should not travel unrestrained in front or back seats. Pets can use carriers, special harnesses that attach to seatbelts, or be put in the back of station wagons when an Australian standard cargo barrier is present. Dogs should not ride unrestrained in the back of trucks/trailers - special restraints should be used to ensure their safety. You may ride across a pedestrian crossing at traffic lights. You may ride on roads and footpaths unless otherwise signed. Local governments may prohibit riding on specific footpaths in the area (identified by NO BICYCLE signs). When riding on roads without marked lanes, ride as near as practical to the far left. On a roundabout with no marked lanes, take up any part of the road to ensure your safety. Do not ride closer than 2m to the rear of a moving vehicle for more than 200m. Two cyclists can legally ride beside each other only when no more than 1.5m apart. Another cyclist can overtake these cyclists. On multi-lane roads you can occupy any part of a lane and travel in the right lane when necessary (e.g. right turns). If you are 17 or older and disobey road rules while riding, you may be given an infringement notice. You can be fined but cannot accumulate demerit points. You can be arrested for drink riding if under the influence of liquor or drugs. Approach and enter the intersection from the far left side of the road. Move forward until you are on the far side of the road you are entering, keeping to the far left side of the intersection. Keep clear of any marked foot crossings and drivers turning left from the intersection. If there are traffic lights, wait until a green light before moving. If there are no traffic lights, give way to approaching drivers on the road you have just left, then move forward. Do not ride past a red traffic light. You can cross if another traffic light you are facing shows a green WALK, walking pedestrian or bicycle symbol. Do not ride past a yellow traffic light (unless you can’t stop safely). If you face a flashing yellow traffic light, use caution when you enter the road and follow give way rules. Ride past a green traffic light if safe. Check your bike’s tyres and brakes regularly. Be courteous to motorists and ride in a predictable manner. Light coloured clothing makes you more visible. At night, use lights/reflectors and wear reflective clothing or wrist and ankle bands to attract attention. A motorised bicycle has an auxiliary electric motor with a maximum output of 200W, or a pedalec as defined by the Vehicle Standard (Australian Design Rule - Definitions and Vehicle Categories) 2005 (Commonwealth). The pedals must be the primary source of power. Bicycles powered by internal combustion engines are illegal on Queensland roads. You do not require a driver licence to ride a motorised bicycle and they are exempt from registration and Compulsory Third Party (CTP) insurance. Motorised bicycles have the same rights, responsibilities, and road rules as bicycles. Always cross at the safest possible point (crossing, lights, refuge). When crossing a road, STOP, LOOK for traffic, LISTEN for approaching cars and WAIT until there is a safe break before crossing. Cross using the most direct route. Allow yourself enough time to cross. Always walk on the footpath or nature strip. If there isn’t one, walk close to the road’s edge, facing oncoming traffic. Do not travel on a dedicated bicycle path, or on the part of a separated path designated for bicycles, unless you are in or pushing a wheelchair, or using a wheeled recreational device. Take care if walking after drinking alcohol. Always keep to the left when walking on a footpath. Cross the road with a group, if possible (more visible). Don’t expect drivers to see you at night. Carry or wear something light in colour and cross under a streetlight if there are no crossings, crosswalks or signals. Pay attention to others’ safety. Never use the device on a road in the same way as a car. Motorised wheelchairs can be registered to an individual or an organisation. Extra rules apply to rollerblades, a skateboard or other wheeled recreational devices (and to children under 12 using a wheeled toy (e.g. pedal car, scooter or tricycle)). Do not travel on a road where the speed limit is 50km/h or more. Do not travel on roads with marked lanes or a white centre line or median strip. Do not travel on a road at night (you may travel on a footpath and cross using the most direct route). Do not use wheeled recreational devices where a sign prohibits. Give way to cyclists on a bicycle or separated path. Keep to the far left side when travelling on a road or footpath. Give way to pedestrians on a footpath or shared path. Check local council laws that may affect wheeled recreational devices. Do not cross if you face a red DON’T WALK or illuminated red pedestrian symbol. Cross with care if you face a green WALK or illuminated green pedestrian symbol. If you face a flashing red DON’T WALK or flashing red illuminated pedestrian signal, complete the crossing if started but do not start to cross. have a working flashing or steady white light at the front, a red light and a red reflector at the rear to use at night or in hazardous conditions. Local councils and land owners can display this sign to prohibit PMDs in areas not appropriate for their use such as malls, esplanades or jetties.